The Pearl District neighborhood is located in Northwest Portland and is bordered by Downtown, Goose Hallow, China Town and the Willamette River. The Pearl District is a former warehouse and industrial area that has been incredibly renovated to be not only one of the hottest areas in Portland, but also in the country. Upscale lofts and townhomes are found in this area with upscale shopping and restaurants lining the streets. The pearl district is always changing and always has events going on. 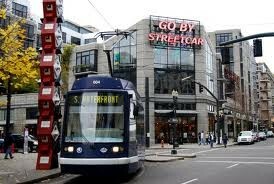 If you are looking for city living the Pearl District is one of the best choices in Portland.